Fruit At The Bottom was the second album by Prince protegees Wendy And Lisa released in 1989 following their self-titled debut. It saw them hit the top 40 singles chart with Satisfaction and cement themselves a solid fan base. It's being reissued with extra tracks as part of Cherry Red offshoot Cherry Pop's revisiting of lost 1980s and 1990s classics. It's probably twenty years since we last listened to it so it's with a sense of curiosity that we put the disc in. What's immediate clear is that, as with the debut, the songs themselves have aged extremely well and both of them have the fine voices that attracted Prince to work with them in his Paisley Park era. The likes of the two main singles Are You My Baby and Satisfaction wouldn't sound out of place if replicated by the some of the current female superstars. The doubts that remain are around the production - most of the time it still sounds fresh, such as most of the aforementioned hit Satisfaction, but there's the odd parts that could be used to carbon-date the record. Once you get past those singles though you get to see a different side of them. Always In My Dreams is a beautiful love-heavy electronic ballad and Everyday evokes similar emotions with a simple looped rhythm and backing vocals to create something that feels quite special. At the start of the second half of the album, From Now On (We're One) is a piece of perfect pop music building to a declaration of love and the rest of the record jumps around from the evocative ballad Tears Of Joy to the hedonistic joyful rush of Someday I back to the more sedate but beautifully constructed drama of I Think It Was December which builds from ballad to electronic epic. It's back to the Prince-style funk for the closing title track with the slightly risque reference to their lover's "fruit at the bottom." As with all these reissues there's a mix of an extra material to go with it, some which add a bit more context to the album and some which can be dismissed. The 7" remix of Are You My Baby condenses the song slightly and makes it more radio-friendly taking off some of the edges of the album version whilst the My Man's 12" version stretches the song out and loosens some of the shackles of the production. Both work really well as additional material. B-side Happy Birthday is a loose, but fun funk work-out that feels like it was created in a jam session and fell into place that way as does the wonderful Hip Hop Love which wouldn't have felt out of place on the album itself. They're not always successful though - the 12" Dance Mix of Satisfaction has some very dated vocal sampling on it that actually would turn us off dancing to it whilst the "according to Prince" version of Lolly Lolly doesn't add much to the original either. 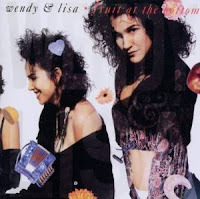 Fruit At The Bottom was the commercial highpoint for Wendy And Lisa with Satisfaction being their only Top 40 single. The following year's Eroica did better in the album charts but didn't quite reach the heights of this album. If you were familiar with them back in the late 1980s or were a fan of Prince around that time, it's an album that's worth your attention and it's aged much better than most of what was being released at the time. Wendy And Lisa's official site can be found here, and they are also on Twitter and Facebook.